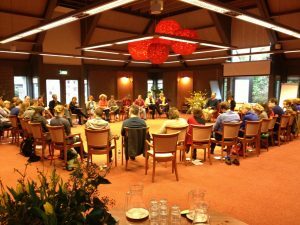 This week we celebrate the first global gathering of graduates of the Transformational Presence Leadership and Coaching program held in Vught, The Netherlands March 7 – 10. Thirty-six of us gathered from eleven countries to take our next steps forward as a community committed to creating a world that works. The theme of the summit was “Vision 2020: Taking Your Gifts To the World.” From the beginning, the energy was palpable, intense, ecstatic, and so full of joy and celebration. Many participants knew each other by voice from teleclasses and coaching circles, yet had never met in person. It was as if they were meeting long-lost family members again. For others, it was a much anticipated reunion with colleagues from their in-person courses. And for all, there was the joy and excitement of meeting community members that were new to them. With Transformational Presence as our foundation, it was quite extraordinary how the group instantly came together. In the first hour, David Robinson, my co-leader of the summit, led us through a fantastic naming process that coalesced the energy. From laughter and delight, we merged into deep connection as we continued with a silent greeting exercise. And from there we were off and running. The focus of the first day was the introduction of a new Transformational Presence leadership and coaching model called “Vision Essence” and a new visioning paradigm. We spent the afternoon in the energy of 2020, letting the future show us the visions and potential that were unfolding through each of us then. It was a powerful process, revealing projects, roles, and ways of engaging with the world that were unexpected for some yet exciting and compelling for all. In the evening, we continued our work with vision essence by exploring the “edges” we realized we would have to cross in order to bring our visions to reality. New doors of awareness and possibility opened and the group energy lifted to an even higher level. I am in awe of the generosity and courage I saw today. I experienced the new Vision Essence tool and I am amazed with the result. Following the energy in doing the process, [the vision] reveals itself and wow, it really surprised me what came out. Trying to describe the energy of the day…it’s somehow beyond words: a connection with self and others [that is] unseen in the mainstream world; gifts exchanged in dialogue and silence [that] we probably don’t even know the value of yet; exercises that call forth a presence for greatness in each of us; a glimpse into 2020 and the amazing world we’ve created by then. Day 2 began with four wonderful presentations from Transformational Presence graduates. Liesbeth Overdijk (Netherlands) opened the day with a beautiful connection to the greater Consciousness. From there, Anna-Lena Smith (Sweden) took us on a journey to understanding how holographic consciousness works, bringing great insight into how we can work in the collective consciousness to manifest the visions we have been shown. Mark Vandeneijnde (France) performed a monologue he had written about a struggling CEO and his awakening to the true potential waiting to unfold in his company. He went on to share his recent short documentary on Heart in Business. Wrapping up the morning, Mary Riley (U.S.) led an intuitive dialogue process (we call it “Enlightened Dialogue,” or someone else aptly named it “heartstorming”! ), asking our support in helping her see the next steps with her company, the Center for Non-Profit Coaching. 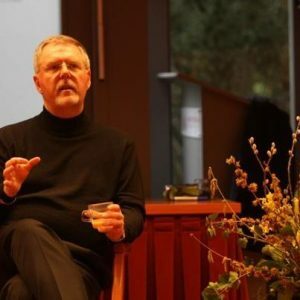 In the afternoon, David Robinson led us through an extended movement and discovery process for working with “edges” with teams and organizations. Alice Larsen (Switzerland) wrapped up the evening with an introduction to a new organizational coaching model she is creating for facilitating the deeper conversations needed to take organizations to greater awareness and success. Day 2 continues to open my mind and heart to this amazing community. The tools, energy and love offered is welcoming and inspiring. Cherishing my time in The Netherlands. My gratitude runs deep. So grateful to be a part of this amazing community supporting each other to live from the vertical and step into the next frontier. 2020 here we come! This evening I was driving from the Summit to my home to sleep and I was suddenly aware of how open my heart is. … I asked myself: How did this happen? Then I realized that this wasn’t the most important question. More important is: How can I support myself and others to this openness? One of the possibilities is to keep on asking questions that can only be answered by the heart. And it starts with me. It’s only when I am open that I can invite others to be so. And guess what – my vision essence is “Be a path!” It starts to get meaning now. … I am so glad I can go back tomorrow morning to this wonderful community. The morning of Day 3 began with a mentor coaching session. Raquel Ark (Germany) offered an illuminating session on the power of praise and affirmation of others for organizational transformation. After lunch, Patricia Koster (Netherlands) brought a wonderfully experiential introduction to energy medicine followed by a discussion of how Transformational Presence could help transform healthcare around the world. Chris Monk (U.K.) led us through a constellation process exploring relationships to self, work, and partner/spouse or family. 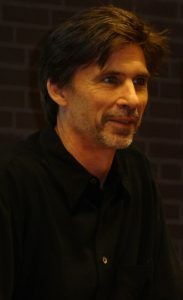 It seemed that nearly everyone had great personal insights and discoveries from his presentation. The afternoon wrapped up with a rich Open Space session led by Katrien Rommens (Belgium) in which small groups formed to discuss topics of their choice related to Transformational Presence in the world. We spent the evening celebrating the summit with a wonderful dinner, great conversation, singing, and just being with one another. I am even more in awe of the people in our community and what is emerging. The essence of each and every person is so real, authentic, and beautiful. So simple, yet so deep and expansive. And the best part is that by being connected to each other, the possibilities are endless. Today’s opportunity to experience potential in different ways through the various presenters was connecting and inspiring. …and each day the work gains energy and power and this amazing community grows in all of its intelligences. The presenters were inspiring and diverse in their offers. The murals are gorgeous and profound. What a gift! And we have another day! What a place for exploration. Thank you, Alan and David! Back in my room after another amazing day … still trying to integrate everything. All the presenters keep on adding to the magic. It’s so amazing to feel and understand this work again on yet another level. The Open Space planted so many seeds to start bringing all our insights into the horizontal world. … World, you ain’t seen nothing yet! Our last morning together was filled with both a sweet sadness and an even more heightened energy as we prepared to journey home. The morning began with a meditation and coaching process for taking our visions to the world, and concluded with closing celebrations. Throughout our four days, the proceedings were captured in “visual minutes” by Vanessa Jane Smith (Spain) and Amber Holmblad (Denmark). They created four murals approximately ten feet long capturing our discussions and experiences in pictures and words. It was so amazing to watch the summit unfold in this visual way. If you are leading a conference, I highly recommend including this dimension to the experience for your participants. It added immeasurably to the richness of our summit. 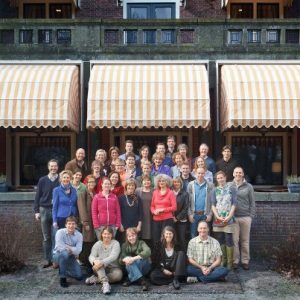 Throughout the four days, Jos Rovers of Het Eerste Huis, our local host and organizer of the summit, as well as Gabriella van Rooij and Marie Josee Smulders of Stichting Seale, supported us with incredible hospitality, love, and attention to every detail. And so our days together at the Huize Bergen came to an end. Yet I can still feel the powerful presence of this community with me. To spend four days co-creating with 35 other people who are all committed to making a significant difference in the world is incredible. I’m already looking forward to the 2014 summit. In the meantime, I celebrate the collaborations and co-creations that are already unfolding towards the manifestation of our 2020 visions. After 4 days at the summit, making friends and experiencing the amazing energy of this group, I feel wiser, calmer, more secure, and much better equipped to face what life brings my way. My eyes and ears are more open than they have been for some time and I’m so thankful. The co-creation of Alan and David and all of the participants brought this event to a much higher level than we could ever have imagined. We have just arrived home yet are still in the energy of this amazing community. Thanks to all of you. Today I had two coaching sessions with clients where I could practice what we preach, going right to the essence instead of talking about all the drama around. It worked out very well and there are two happy clients who can go forward. I thank you all. It was just plain magic, and WE co-created it all!